Welcome to the late nineteenth century parlor of the McFarland House. 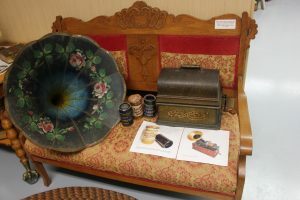 We are not sure of the furniture arrangement but the settee, chairs and corner table in this display were originally used by the family of William McFarland. Also, the melodeon was part of the family history with the railroad records stating “1 melodiean, 1 stool” was received by William H. McFarland on September 14, 1863. In many homes the parlor was separated from the rest of the house by two large doors and used only on special occasions. In others, it was an everyday part of the house. The parlor stove often heated all rooms except the kitchen. This unique parlor stove used hard coal and was self-feeding. A fire was started with wood kindling. After it was burning steadily, the stove was filled from the top with coal that would keep it burning 24 hours. The stove has three draft controls to regulate the rate of burning. In mild weather the rate of burning could be slowed so much that the fire would last for three days. The red glow of the hot coals in this stove seen through the windows made of transparent mica gave both warmth and a cheery atmosphere to the room. Across the street from the McFarland House, John McFarland used this parlor stove in his soda and ice cream parlor. The business was located in a building that replaced a former livery barn operated by John on the same site. John was the stepson of William McFarland after his mother Mrs. Celia Nelson became William’s second wife. 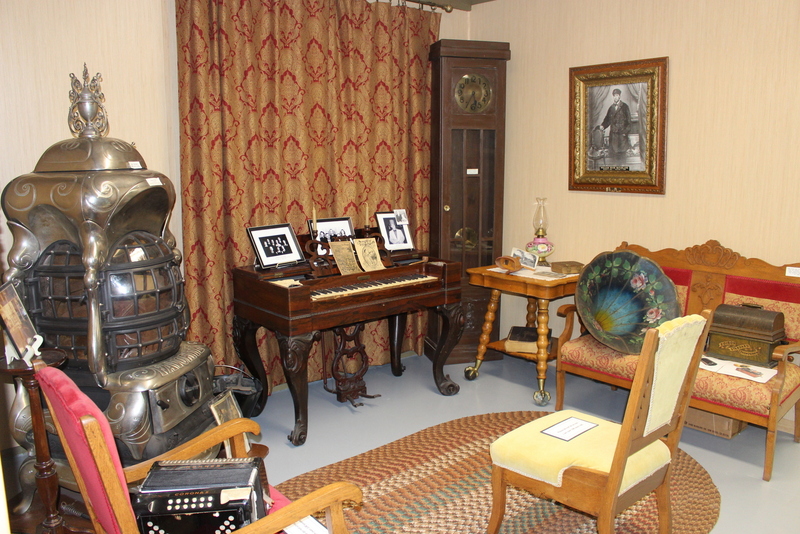 Perhaps the McFarland’s parlor was the place where family and friends gathered to listen to William’s phonograph. His was one of the cylinder-type record players and the first in the area, according to son Joe. It was quite a novelty so many people came to listen to it. William would take it to school at the request of the teachers, hauling it back and forth to the schoolhouse on a wheelbarrow according to Oscar Sperle, one of the students at the time. The students enjoyed it so much because they got out of doing their schoolwork while William was entertaining them.